For years now, I've had an idea for the Ideal country place. A place where I could have privacy, but also a sense of community. Where I could have access to hundreds, even thousands, of protected acres for riding and hiking but without an owner's upkeep and taxes. Where I could drive 10 minutes into a cultural center, yet know that Wal-Mart or a sea of McMansions would never become my neighbor. 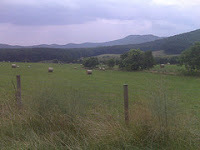 Bundoran Farm, a 2300 acre working farm 10 minutes South of Charlottesville, VA, is making this idea a reality. Using, "Preservation Development," Bundoran seeks to protect the rural character of this lovely Place in the mountains, while allowing about 100 families to make it their home. Residents are required to build green houses that fit into the character of the land, allow other residents to cross the pedestrian/equestrian trails on their parcel, and allow their land to be farmed in perpetuity. In return, they are granted unlimited access to the entire 2300 acres and can be assured that the farm will look the way it does for the rest of their lifetimes. It's expensive to purchase property at Bundoran (by necessity) but I have hopes that this wonderful concept can be applied in different ways to other parcels of land around the United States for people with lesser means. Rather than cutting big land parcels into a patchwork quilt of 3-acre lots, as we do here in Western Loudoun County, it would be better to cluster houses close together and leave most of the land in fields and forests that are farmed and shared by all residents. It's an idea whose time has come -- this sharing of property. It's more beautiful, less work for individuals, and more sustainable. More importantly, it allows places to remain Places. For more on this wonderful rural Place, listen to this podcast. Thank you for writing about Bundoran Farm. It really is an incredible place with remarkable principles and foundations. Anytime you're in Charlottesville, feel free to contact me and I will be happy to show you around the land. One of the best things about Bundoran, aside from the land, are the people involved - the truly care about the project and the impact they are having - locally and on development principles as a whole. My husband and I are truly impressed with Bundoran. During our visit last weekend we could feel how much the people involved truly care about creating/maintaining a Place that matters. The way the roads were built, the nature paths created, the future homes sited. . . all just lovely.